انصاری, عبدالحمید, فاتحی, مسلم, علمدار, کمال. (1391). برآورد مرز بی‌هنجاری‌های مغناطیسی رباط پشت‌‌بادام به کمک مشتقات میدان پتانسیل و ترکیبات مکانی و فازی بین آنها. 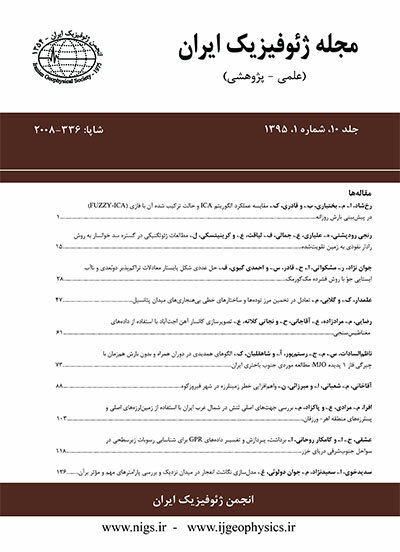 مجله ژئوفیزیک ایران, 6(3), 31-45. عبدالحمید انصاری; مسلم فاتحی; کمال علمدار. "برآورد مرز بی‌هنجاری‌های مغناطیسی رباط پشت‌‌بادام به کمک مشتقات میدان پتانسیل و ترکیبات مکانی و فازی بین آنها". مجله ژئوفیزیک ایران, 6, 3, 1391, 31-45. انصاری, عبدالحمید, فاتحی, مسلم, علمدار, کمال. (1391). 'برآورد مرز بی‌هنجاری‌های مغناطیسی رباط پشت‌‌بادام به کمک مشتقات میدان پتانسیل و ترکیبات مکانی و فازی بین آنها', مجله ژئوفیزیک ایران, 6(3), pp. 31-45. انصاری, عبدالحمید, فاتحی, مسلم, علمدار, کمال. برآورد مرز بی‌هنجاری‌های مغناطیسی رباط پشت‌‌بادام به کمک مشتقات میدان پتانسیل و ترکیبات مکانی و فازی بین آنها. مجله ژئوفیزیک ایران, 1391; 6(3): 31-45. امروزه استفاده از بررسی‌‌های مغناطیسی، به‌‌خاطر برداشت سریع، در اکتشاف توده‌‌های مغناطیسی به‌شکلی گسترده صورت می‌‌گیرد. به‌‌همین‌‌دلیل، تفسیر داده‌‌های مغناطیسی اهمیت خاصی پیدا کرده است. ماهیت دو‌قطبی میدان مغناطیسی باعث پیچیدگی تفسیر داده‌‌ها می‌‌شود. تفسیر را می‌‌توان شامل : مشخص کردن بی‌هنجاری و مرز توده سبب شونده، برآورد عمق و مدل‌سازی توده دانست. هدف این مقاله مرحله اول تفسیر، یعنی مشخص کردن محل توده سبب شونده بی‌هنجاری مغناطیسی و تعیین مرز دقیق آن است. مشتقات میدان مغناطیسی و روابط وابسته به آن، در برآورد مرز توده‌‌های مغناطیسی کاربرد گسترده دارد. در این مقاله، به بررسی مقایسه‌ای بین صافی‌های برآورد مرز شامل مشتق افقی، مشتق قائم، سیگنال تحلیلی، زاویه تیلت و کسینوس زاویه تتا پرداخته شده است. برای بررسی و مقایسه کارایی صافی‌های ذکر شده، از داده‌های مصنوعی که با استفاده از نرم‌افزار مدل‌ویژن به‌دست آمده‌اند، استفاده شده است. مقدار بیشینه مشتق افقی روی مرز توده قرار می‌گیرد، مشتق قائم روی توده مقدار بیشینه و بیرون از آن کمینه مقدار را دارد. مشتق قائم محدوده توده را وسیع‌تر از مقدار واقعی نشان می‌دهد که با استفاده از صافی مشتق قائم مراتب بالاتر این مشکل برطرف می‌شود و از طرف دیگر باعث ایجاد نوفه‌‌های مصنوعی می‌شود. از سیگنال تحلیلی نیز در برآورد مرز توده استفاده می‌‌شود که با افزایش عمق توده، از کارایی آن کم می‌شود. زاویه تیلت که نسبت بین مشتق قائم به مشتق افقی است، روی توده مقدار بیشینه دارد. کسینوس زاویه تتا روی مرز توده مقدار بیشینه را نشان می‌دهد و به‌‌خوبی مرز توده را تعیین می‌‌کند. در آخر داده‌‌های واقعی محدوده‌‌ای واقع در منطقه رباط پشت‌‌بادام یزد مورد پردازش قرار گرفته است. Magnetic data is routinely presented as contours or color-shaded maps of the total magnetic intensity (TMI). An interpreter’s task is to identify features (anomalies) within the map and qualitatively and/or quantitatively interpret them into geologic structures at depth. An interpretation difficulty with TMI anomalies is that they are dipolar (anomalies having positive and negative components) such that the shape and the phase of the anomaly depends in part on the magnetic inclination and the presence of any remanent magnetization. This anomaly complexity makes the interpretation more difficult because the body and its edges do not necessarily coincide with the most obvious mapped feature (e.g., anomaly maxima). The reduction-to-the-pole (RTP) technique transforms TMI anomalies to anomalies that would be measured if the field were vertical. This RTP transformation makes the shape of magnetic anomalies more closely related to the spatial location of the source structure and makes the magnetic anomaly easier to interpret, as anomaly maxima will be located centrally over the body. Since the early 1970s a variety of automatic or semiautomatic methods, based on the use of the horizontal and/or the vertical gradients (derivatives) of potential-field anomalies, have been developed as efficient tools for the determination of the geometric parameters, such as the locations of the boundaries and the depths of the causative sources. The success of these methods results from the fact that quantitative or semi-quantitative solutions are found with no or few assumptions. To map the edges of the bodies, the horizontal derivatives of the RTP field are often used. The horizontal derivative will peak above a vertical contact. However, a dipping contact, an incorrect inclination used in the RTP transformation or presence of remanent magnetization, will tend to shift the anomaly maxima away from the true location of the contact. Vertical derivatives are used in the interpretation of potential field anomalies extensively. This filter enhances the details and sharpens anomalies. However, difficulty is that by this filter the noises are increased as signals are enhanced. This filter is normally used with the first and second orders. However, vertical derivatives are recently applied with a non –integer order, in order to produce a good equilibrium between signal and noise. The analytic signal for magnetic anomalies was initially deﬁned as a “complex field deriving from a complex potential” (Nabighian,1972). This function can be computed easily in the frequency domain; its real part is the horizontal derivative of the field and its imaginary part is the vertical derivative. Analytic signal processing and interpretation requires few initial assumptions regarding the source body geometry and magnetization and is particularly efficient at an early stage of the interpretation even if the constraints are not available. The amplitude of the 3-D analytic signal of the total magnetic field produces maxima over magnetic contact regardless of the magnetization direction. The “theta map” is a processing technique, derived from the analytic signal that highlights the magnetic contact in a TMI image. The method is equally valid for data that has been reduced to the pole or to the equator, but it was developed to process data gathered at low magnetic latitudes, where traditional reduction to the pole is not advisable. The theta map independently detects the edges of the strike and amplitude and is thus the most valuable at low latitudes where north-south-trending anomalies disappear in the TMI data. It can also be used to qualitatively estimate dip. The magnetic tilt angle is a normalized derivative based on the ratio of the vertical and horizontal derivatives of the RTP field. The tilt angle was first described by Miller and Singh (1994), before being further refined by Verduzco (2004) and Getech. The value of the tilt angle above the edges of the contact is zero. This suggests that contours of the magnetic tilt angle can identify the location (θ = 0°) of the contacts. In this study, we applied the described filters on synthetic and real data that gathered from the iron deposit in Robat Posht Badam in Yazd Province in Iran. بلیکلی، د.، (1995)، تئوری پتانسیل در گرانی و مغناطیس کاربردی، ترجمة حسین‌زاده گویا، ن.، انتشارات دانشگاه تهران، 1387. علمدار، ک.، انصاری، ع.، 1387، استفاده از فیلتر مشتق قائم با مرتبه‌‌های متفاوت در تفسیر بی‌هنجاری‌‌های میدان پتانسیل، مجلة ژئوفیزیک ایران، 2(2)، 39-49. Debeglia, N., and Corpel, J., 1997, Automatic 3-D interpretation of potential field data using analytic signal derivatives: Geophysics, 62(1), 87–96. Hsu, s. k., and Sibuet, j. c., and Shyu, c. t., 1996, High-resolution detection of geologic boundaries from potential-field anomalies, an enhanced analytic signal technique: Geophysics, 61(2), 373-386. Miller, H. G., and Singh, V., 1994, Potential ﬁeld tilt—A new concept for location of potential ﬁeld sources: J. Appl. Geophys., 32, 213–217. Nabighian, M. N., 1972, The analytic signal of two-dimensional magnetic bodies with polygonal cross-section: Its properties and use for automated anomaly interpretation: Geophysics, 37, 507- 517. Nabighian, M. N., 1984, Toward the three- dimensional automatic interpretaion of potential field data via generalized Hilbert transforms, Fundamental relations: Geophysics, 53, 957-966. Roest, W. R., Verhoef, J., and Pilkington, M., 1992, Magnetic interpretation using the 3-D analytic signal: Geophysics, 57, 116-125. Salem, A., and Williams, S., 2007, Tilt-depth method: A simple depth estimation method using first order magnetic derivatives: The Leading Edge, 26, 1502-1505. Verduzco, B., Fairhead, J., Green, C., and MacKenzie, C., 2004, New insights into magnetic derivatives for structural mapping: The Leading Edge, 23,116–119. Wijns, C., Perez, C., and Kowalczyk, P., 2005, Theta map: Edge detection in magnetic data: Geophysics, 70(4), L39–L43.